Today was a pretty good day. At the end of work I was looking forward to getting a workout in when I got home. I had a huge craving for peanut butter and I knew I didn't have any at home so I stopped at Whole Foods on the way to the train. When I walked through the produce section one of the workers was re-stocking the strawberries. I hesitated, but kept walking to the peanut butter isle where I saw an old man sampling the almond butter right out of the serve yourself nut grinders. Great. I waited patiently for him to move so I could get what I needed. I was thinking of almond butter for a change but it was too expensive so I just grabbed my old faithful peanut butter. I started walking towards the registers but those strawberries called me back. They had local strawberries, but I wasn't paying attention and grabbed the ones from California. Oh well, they were cheaper anyway. I walked over to the T and broke into the berries right away. (I didn't rinse them, I know... but I'm still alive!) They were sooooo good. When I got home I made the snack you see above. My intentions were to eat that quick snack and head over to the gym. But somewhere in there I remembered that I needed to go to CVS for a prescription refill and also to the grocery store and I was also starting to fall asleep on the couch. I could list a million excuses as to why I just couldn't go to the gym tonight, but I won't. I just didn't go. Oh well. 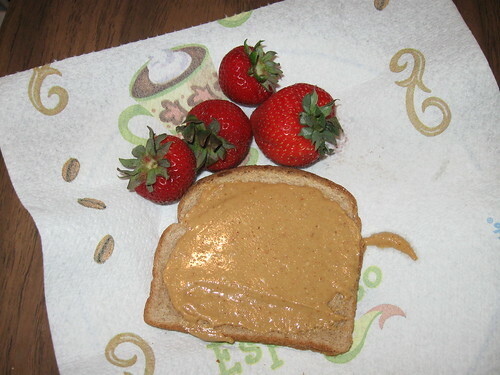 I was craving peanut butter because I've been reading some new blogs and it seems like they eat lots of nut butters all the time! These ladies are so inspirational and they are really helping me to stay focused while I try to get back on track. Kath, Tina, Jenna, Meghann, Heather, and Caitlin are the lovely gals that are blogging all about their healthy ways and it's really awesome. I love each of their blogs, check them out! Speaking of those ladies...we need to discuss the healthy eating event tonite! I know!!! I am totally going! I can't wait!